This collaborative fiber art project was organized to raise awareness for and share resources around suicide prevention. Learn more on the Stitches for Suicide Prevention project page. This is a site-specific installation for the Torpedo Factory Art Center. Read more about the project. This work is a series of synonyms for the words "begin" and "end" translated into Morse code and knit where one stitch = one beat and one row = one letter. The piece is knit using waste yarn from former projects. Video walk-through of This is a Sentence exhibition in the Common Ground Gallery at VisArts (October 19 – November 20, 2016). This work comprises the phrase "My name is" translated into Morse code in the 50 most widely spoken languages, where one stitch = one beat and one vertical row = one language. Each of the three components in this piece is the same script—a series of synonyms for the word "look"—translated into Morse code and knit using three separate methods. In this two-piece work, my partner and I were provided the same list of words and asked to write what we perceived to be the antonyms. The resulting side by side view of our responses visually represents how our answers differ, emphasizing the subjectivity of language. This work is a string of phrases that hold a unique meaning within my nuclear family. Phrases like "frim fram and frickle fry" or "kout the road," while formed from English words, might still be unrecognizable to English speakers outside of the Wike household. This work is a series of universal symbols, described in text and translated into Morse code where one stitch = one beat and one row = one sentence. While the content of this piece revolves around symbols we consider to be understandable in any language, the work resulting from this process is illegible and unidentifiable in any language. 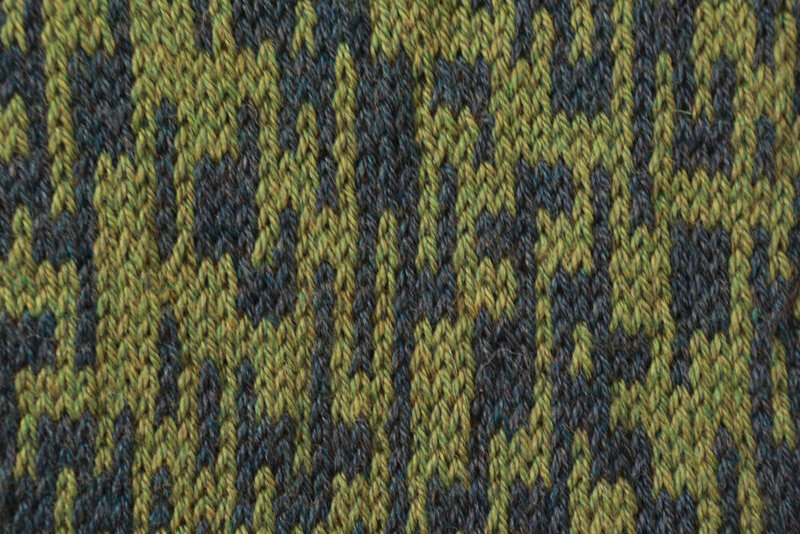 This piece is a series of homophones translated into Morse code and knit side by side, one to the left of the black bar and one to the right, indicating the visual differences that we do not audibly perceive (ex : "raise, raze," "bear, bare"). This piece is a list of English language idioms translated into Morse code and strung together in a continuous line, where one stitch = one beat and one row = one letter. Turns of phrase such as "kick the bucket," "in a new york minute," "it's all greek to me," and "beating around the bush," are included.